New PEER Report 2019/01: "Flow-Failure Case History of the Las Palmas, Chile, Tailings Dam"
New PEER Report 2018/04: "Capturing Directivity Effects in the Mean and Aleatory Variability of the NGA-West2 Ground-Motion Prediction Equations"
New PEER Report 2018/05: "Selection of Random Vibration Procedures for the NGA-East Project"
New PEER Report 2018/07: "An Empirical Model for Fourier Amplitude Spectra using the NGA-West2 Database"
New PEER Report 2018/06: "Estimation of Shear Demands on Rock Socketed Drilled Shafts subjected to Lateral Loading"
PEER Research Project Highlight: "How the Water/Binder Ratio and Voids Affect the Performances of Hardened Concrete Subjected to Fire"
PEER Research Project Highlight: "A Systematic Computational Framework for Multi-span Bridge PBEE Applications"
2018 Blind Prediction Competition Now Open! 2018 PEER Blind Prediction Competition - COMING SOON! PEER Request for Proposal: Solicitation TSRP-PEER 18-01. Now Closed. PEER Research Project Highlight: "Caltrans-PEER Workshop on Characterizing Uncertainty in Bridge-Component Capacity Limit-States"
New PEER Report 2018/03: "Probabilistic Seismic Hazard Analysis Code Verification"
PEER Research Project Highlight: "NGL: Next Generation Liquefaction Database Development and Implications for Engineering Models"
PEER Research Project Highlight: "Micro-inspired Continuum Modeling Using Virtual Experiments"
New PEER Report 2017/12: “Experimental Investigation of the Behavior of Vintage and Retrofit Concentrically Braced Steel Frames under Cyclic Loading"
PEER Research Project Highlight: "Post-earthquake Fire Performance of Industrial Facilities"
PEER Research Project Highlight: "Fluid–Structure Interaction and Python Scripting Capabilities in OpenSees"
11/04/15 - 2016 PEER Annual Meeting, January 28 – 29, 2016. Registration Now Open! 11/03/15 - PEER Lab Highlight – Video Now Available! 07/29/15 - PEER at First Responders Appreciation Day, July 23 – CA State Fair — a great success! 08/22/14 - Performance of Conventional and Innovative Special Structural Walls – Video Available! 05/23/14 - NGA-East 2014 First Quarter Technical Update Now Available! 12/23/13 - Videos showing nees@berkeley experiments on nonstructural building cladding systems and residential seismic isolation are now available! 11/13/13 - NGA-East 2013 Third Quarter Technical Update Now Available! 10/09/13 - Hybrid Simulation of Multi Story Structural Systems Through Collapse tested at nees@berkeley – video now available! 09/26/13 - A Busy Summer of OpenSees: New Elements, New Tools, and Lots of Training! 05/15/13 - NGA-West2 Flatfiles and GMPE Reports Now Available! 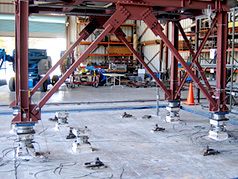 03/28/13 - Seismic Performance of Steel Column Splices tested at nees@berkeley – video now available! 07/20/12 - PEER’s YouTube Channel highlights NGA-West2, OpenSees, nees@berkeley projects, and more! 05/17/12 - 2012 PEER Annual Meeting on Oct 26 & 27 – Save the Date! 04/12/12 - NGA-East Technical Update: now available! 02/23/12 - PEER BridgePBEE Analysis Framework (Beta Version): Just released and ready for use! Are you prepared for the next Big One? Announcing a New PEER Publication! Of the 14 competing student teams, Oregon State University took first place in the 4th Annual Seismic Design Competition for Undergraduates, jointly sponsored by the Pacific Earthquake Engineering Research Center (PEER), Earthquake Engineering Research Institute (EERI), Mid-America Earthquake (MAE) Center and MCEER. The event, held during the EERI Annual Meeting, February 7-10, in Los Angeles, was an opportunity to demonstrate performance-based, cost-effective seismic design. A select group of GeoEngineering Earthquake Reconnaissance (GEER) Association members, including PEER representatives, along with EERI LFE and ASCE TCLEE teams, will prepare a unified report on the effects of the Niigata-Ken-Oki Earthquake that occurred on July 16, 2007. Also involved will be other U.S. organizations such as the NRC, the NSF Earthquake Engineering Research Centers, and state organizations. This effort will be coordinated with the appropriate Japanese authorities and earthquake engineers. The team is composed of both senior and junior geo-engineers including Robert Kayen (team leader) of the U.S. Geological Survey (USGS); Scott Ashford of Oregon State University (OSU); Scott Brandenburg of the University of California at Los Angeles (UCLA); Brian Collins of USGS; Steve Dickenson of OSU; and Yohsuke Kawamata of OSU. An effort was made to bring in members who had not been supported on recent NSF-supported reconnaissance efforts, while ensuring that some with experience in recent post-earthquake reconnaissance efforts in Japan were included. Questions concerning this report may be directed to Rob Kayan of USGS at rkayen@usgs.gov, or Jonathan Bray of the University of California, Berkeley, at bray@ce.berkeley.edu. MEDIANEWS STAFF Article Launched: 08/11/2007 03:02:19 AM PDT SAN FRANCISCO — Officials invoked the 1989 Loma Prieta earthquake, the MacArthur Maze meltdown and Hurricane Katrina in their testimonials Friday for the idea of a waterborne emergency response system for the Bay Area. Transportation officials all the way up to Caltrans Director Will Kempton testified at the San Francisco Ferry Building for a state Senate select committee that included Sen. Tom Torlakson, D-Antioch. Torlakson is the author of Senate Bill 976, which directs the Bay Area Water Transit Authority to focus on operating a regional water transit system and coordinating the system’s emergency response in the event of a disaster such as a major earthquake or terrorist attack. Until the replacement of the eastern span of the Bay Bridge — closed for a month after the 1989 quake — is expected to be completed in 2013, the existing 71-year-old span will remain vulnerable to failure in another earthquake, warned Jack Moehle, director of the Pacific Earthquake Engineering Research Center at UC Berkeley. A major temblor along the Hayward fault could also cripple BART and cause devastation on par with the 1995 Kobe, Japan, earthquake, which killed thousands, collapsed expressways and shut down railways and port facilities. “We will be reminded that the Bay that defines our region also divides us,” said Jim Wunderman, president of the Bay Area Council of major business executives. On the other hand, those same waters could also reunite the area with a coordinated use of ferries, he said. But assembling an adequate emergency water transit system could take 30 years if done in a “business-as-usual way,” he added. “We need money and we need it soon,” Wunderman told Torlakson. “We need to act now as if the emergency had already happened,” to avoid the kind of ineffectual response that doomed New Orleans residents after Hurricane Katrina. The council is backing a major expansion of ferry service in the Bay Area intended to provide alternative transportation during an emergency. The plan calls for new ferries, floating docks and other facilities and equipment totaling as much as $1.6 billion. Even though the area’s transportation arteries rebounded from Loma Prieta fairly quickly, that likely won’t be the case in a stronger, closer quake, Moehle said. “The 1989 Loma Prieta earthquake, I believe, lulled Bay Area residents and officials into thinking they can survive ‘the Big One.’ The Loma Prieta earthquake was not the Big One,” Moehle said. Many of the area’s freeways are on what could literally be called shaky ground — Bay flats that were filled in and are now subject to liquefaction, Moehle said. He said that although watercraft are capable of transporting medics, firefighters and commuters after a disaster, such transportation will need reliable land access — not just boats and docks but also roads leading to those docks. Bill McCammon, former Alameda County fire chief, praised the value of centralized control of a water transit system during a disaster, but he cautioned that the Water Transit Authority needs to closely coordinate with local emergency services managers to make sure the system will meet their needs. Kempton, the Caltrans director, said a water transit system would be helpful during a disaster. “You can’t be too prepared in an emergency,” Kempton said. In addition, having a larger network of ferries would help keep people moving when there is no disaster, he said outside the hearing room. “There’s no question that there will be damage to the transportation structures in the Bay Area and we will need to respond quickly,” he said. “The water isn’t going to go away when there’s an earthquake.” “The more transportation facilities we have, the better the functioning of the overall system,” he said. The journal Earthquake Spectra will be publishing a special issue on results obtained from the Next Generation Attenuation (NGA) project. Papers are invited on the ground motion prediction equations developed through the NGA project, the characteristics of the database developed during the project, the simulation exercises conducted to support the development of the prediction models, and other related subjects. When the manuscript is uploaded, authors must select “Special Issue on NGA” from the drop down list for special issues. The cover letter accompanying your manuscript should clearly indicate that the paper is being submitted for review and possible publication in the NGA special issue of Earthquake Spectra. All papers to be reviewed for the special volume must be received by July 1, 2007. We expect to have preliminary review decisions by September 2007 and final decisions on revised papers by December 2007. The special volume should appear in print in March 2008. Papers without a clear link to the NGA project will not be reviewed for this special issue. Questions regarding paper content or submission procedures should be directed to the Guest Editors for the special volume, Jonathan Stewart (jstewart@seas.ucla.edu), Ralph Archuleta (ralph@crustal.ucsb.edu), or Maurice Power (mpower@geomatrix.com). Prospective authors are encouraged to send abstracts of their articles by email to the guest editors prior to formal manuscript submission so that the suitability of the paper topic to the special issue can be evaluated. Please send your abstracts by July 15, 2007. Complete manuscript of paper/s is due by December 1, 2007. Please send your abstract to: 6icchge@umr.edu. If you have any questions, please contact Shamsher Prakash, Conference Chairman, at prakash@umr.edu. PS - Past proceedings of University of Missouri – Rolla, conferences on Case Histories and Geotechnical Earthquake Engineering conferences are offered on discount to clear inventory. Please visit conference web site to see Table of Contents of available conferences and the order form. PEER is hosting five interns at UC Berkeley this summer. These students will learn about earthquake engineering and how to conduct research experiments on civil engineering applications. The students are Veronica Crothers from San Francisco State University; Kristopher Darnell of the University of Texas at Austin; Daniel Lombardi of Syracuse University; Nicholas Trombetta of the University of Virginia; and Orry Zumbiel of the University of Kentucky. Daniel, Nicholas and Orry will work with Professor Jack Moehle; Veronica will assist Professor Steve Mahin; and Kristopher will work with Professor Jonathan Bray. In addition to these interns, there are eight students being hosted at various other PEER core institutions. NEES Grand Challenge researchers have received a 2007 SEAONC Award of Merit for their work in developing revisions for the new ASCE/SEI 41 standard on seismic rehabilitation of buildings. The Pacific Earthquake Engineering Research Center (PEER) has been awarded a five-year, $3.6 million NEES Grand Challenge grant from the National Science Foundation (NSF) to study the collapse potential of older nonductile concrete buildings during earthquakes. These buildings are pervasive throughout the U.S. and other countries, and are considered a high risk. The project will fully utilize the George E. Brown Jr. Network for Earthquake Engineering Simulation (NEES). Read More. The James Roberts Best Paper Award was presented to Brian Chiou of the California Department of Transportation at the Fifth National Seismic Conference on Bridges & Highways, in San Mateo, in September. Read More. Simpson Gumpertz & Heger Inc. (SGH) becomes an official BIP member. The presentations from OpenSees Days 2006 are now available. 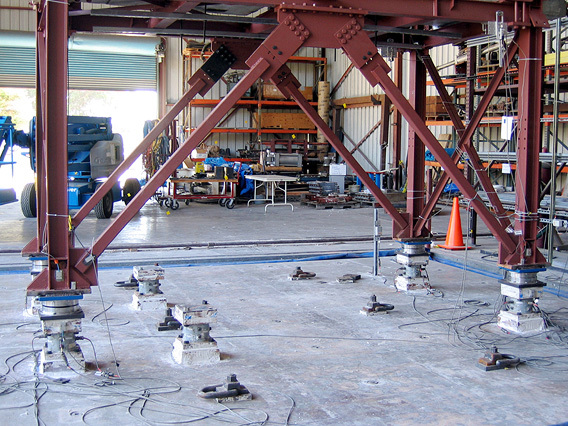 UC Berkeley’s Earthquake Engineering Research Center ran a series of shake table tests using a three-story tall, braced steel frame to demonstrate the effects of the new type of bearing with a low-friction slider having moderate initial stiffness. Test results will help understand base isolation applications of the PEER performance-based earthquake engineering methodology. Read ABC’s full story and see the June 15 broadcast. PEER Director Jack Moehle has been named an honorary member of the Structural Engineers Association of Northern California. This designation by the Board of Directors is a special recognition of Moehle’s contribution to the excellence of the structural engineering profession. He was specifically cited for his contributions in education of a generation of structural engineering students; innovative and practical research in a broad range of subjects in earthquake engineering; and leadership and contributions in development of structural engineering codes and guidelines, including the American Concrete Institute Building Code Provisions, and several Applied Technology Council, EERI, and FEMA documents on the seismic assessment, design, repair and rehabilitation of buildings and bridges. “NBC Dateline” recently teamed up with Dr. Khalid Mosalam and the University of California, Berkeley’s Earthquake Engineering Research Center to sponsor a unique demonstration that showed an earthquake’s destructive power, and described survival tactics. Of the eight competing student teams, the University of Washington took first place in the 3rd Annual Seismic Design Competition for Undergraduates, jointly sponsored by the Pacific Earthquake Engineering Research Center (PEER) and the Earthquake Engineering Research Institute (EERI). The event, held during the 100th Anniversary Earthquake Conference, April 18-21, at Moscone Center, was an opportunity to demonstrate performance-based, cost-effective seismic design. Read More. Pacific Earthquake Engineering Research Center (PEER) was awarded a $2,250,000 research contract from the California Department of Transportation Caltrans). This five-year contract is part of PEER Lifelines’ Program to carry out various research projects related to seismic performance and reliability of lifelines. Research projects under this contract will include engineering characterization of earthquake ground motion, response of soil during severe ground shaking, and seismic analysis and performance of bridges and lifelines systems. The Principal Investigator of this contract is Professor Jack Moehle, PEER Director. The co-PI is Dr. Yousef Bozorgnia, PEER Associate Director. The Caltrans project manager is Mr. Tom Shantz, Division of Research and Innovation. Jack P. Moehle, professor of civil and environmental engineering at the University of California, Berkeley and director of the Pacific Earthquake Engineering Research (PEER) Center, was chosen as EERI’s 2005 Distinguished Lecturer. (RealOne player required) at Sibley Auditorium in Bechtel Hall on the topic of “Performance-Based Design: Developments and Applications.” Read More. The National Science Foundation’s (NSF) 2004 East Asia and Pacific Summer Institutes Program (EAPSI) for U.S. Graduate Students will offer just such opportunities for 150 advanced science and engineering students this summer in Australia, China, Japan, Korea, and Taiwan. NSF will support these students as they conduct research with foreign counterparts in fields such as cancer research, humanoid robotics, computational neuroscience and nanofabrication. Read More. Debra Jacob has been named Director of Communications for PEER. She brings to her position several years of marketing communications and PR experience in the engineering field. She has managed communications programs for Carnegie Mellon University’s College of Engineering and research centers, Bayer Corporation’s Automotive Polymers Division, and the Society of Automotive Engineers (SAE). She is a Pennsylvania native.